Krishnamurthy was born at Puttamangalam in the Thanjavur district in an orthodox, large Brahmin family with limited means. After primary education in the village, Krishnamurthy joined the National High School at Tiruchy, about 100 Kilometers away. When Mahatma Gandhi launched his non-cooperation movement in 1921, thousands of students gave up their studies to participate; Krishnamurthy was among them. Inspired by Gandhi's speech at a public meeting in Tiruchi, and despite the Secondary School Leaving Certificate examination being just three months away, he left school and joined the Indian National Congress. In 1922, he was given a one-year prison sentence for participating in the independence struggle. It was during this period that Krishnamurthy came into contact with two people who were to play a major role throughout his life: veteran Congress leader C.Rajagopalachari, and T.Sadasivam who was to become a life-long friend and partner in journalistic ventures. Krishnamurthy's first attempt at writing fiction also came during that period. In 1923 he became a sub-editor on Navasakthi, a Tamil periodical edited by Tamil scholar and freedom fighter V.Kalyanasundaram known as "Thiru Vi. Ka". Krishnamurthy's first book was published in 1927. Leaving Navasakthi in 1928, Krishnamurthy stayed with C. Rajagopalachari at the Gandhi Ashram in Thiruchengode in Salem district and helped him edit Vimochanam, a Tamil journal devoted to propagating prohibition. In 1931, he was again imprisoned for six months. Next year Krishnamurthy joined Ananda Vikatan, a weekly edited and published by S.S.Vasan, as its de facto editor. The magazine soon became a household name in middle class families. Krishnamurthy's witty, incisive comments on politics, literature, music and other forms of art were looked forward to with unceasing interest by readers. He wrote under the pen names of "Kalki", "Ra. Ki", "Tamil Theni", "Karnatakam" ,and so on. Vikatan published many of his short stories and novels (as serials). The name Kalki denotes the impending tenth Avatar of Lord Vishnu in the Hindu religion, who it is said, will bring to an end the Kali Yuga and reinstate Dharma or righteousness among the worldly beings. He used the name because like the Avatar he wanted to bring about great changes, and also in honor of his mentor Kalyana Sundaram Mudaliyar taking the "Kal" from his name and the "Ki" from his own. He is often referred to as "Kalki Krishnamurthy" or simply "Kalki". In 1941 he left Ananda Vikatan and rejoined the freedom struggle and courted arrest. On his release after three months he and Sadasivam started the weekly,Kalki He was its editor until his death on December 5th,1954. Ponniyin Selvan ("The Son of Ponni") is a famous 2400 page 20th-century Tamil Historical Novel written by Kalki Krishnamurthy. Written in 5 volumes, this narrates the story of Arulmozhivarman (later crowned as Rajaraja Chola).Ponniyin Selvan (Ponni's Son) dealt with the fortunes of the Chola empire during the 10th century. It was serialised in the Tamil periodical Kalki. The serialisation went on for three and a half years and every week its publication was awaited with great interest. Historical background Ponniyin Selvan is a romantic story, which has real historical characters and real historical incidents. Vijayalaya Cholan (848-871 CE) was the founder of the later Chola dynasty. He conquered the country from a vassal chief of the Pallavas, and established Thanjavur as the capital of the dynasty. His son and successor Aditya I conquered the Pallavas and the Kongu country. Later, under the leadership of his son Parantaka (c 907-955 CE), the cholas acquired a dominion which foreshadowed the greater empire of Rajaraja and Kulothunga Chola. Parantaka I won victories over the Banas, the Gangas, the Pandya and the King of Ceylon. This fact and the extent of his conquest are known from his inscriptions. Towards the end of his reign, or before his death, the Rashtrakutas under Krishna III invaded the Tamil Country, killed the Chola prince Rajaditya at Takkolam (near Arakkonam) in c. 948 CE , and seized Tondainadu which they seemed to have ruled for about a quarter of a century, confining the sway of the Cholas to their ancestral dominion comprising the modern day Tanjavur and Thiruchirapalli districts. The names of the next five kings after Rajaditya are known, but little is on record regarding their life history. They were Gandaraditya, Arinjaya Chola, Parantaka Chola II, Aditya Karikalan or Aditya II and Madurantaka. Aditya Karikalan II appears to have re-conquered Tondainadu a few years later. On Aditya's death, or on the death of Parantaka II, whichever was the later, the succession was probably disputed. Most of the nobles and subjects preferred that Arulmozhivarman (Rajaraja) ascend the throne, but he himself was in favour of his uncle, Madurantaka Uththama Chola becoming the king.Eventually, Arulmozhivarman was appointed heir-apparent. Rajarajan became the king in 985 CE. His reign was the starting point of a period of unexampled prosperity. Ponniyin Selvan was the sobriquet given to Raja Raja Chola. 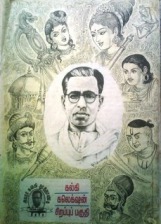 The original title of Arulmozhivarman was Rajakesari Varman or Mummudi-Sola-Deva. He was the second son of the Parantaka Chola II alias Sundara Chola and Vaanamaadevi. Raja Raja Cholan had an elder sister, Kundavai and an elder brother, Aditya Karikalan. He had a high regard for his sister, who spent her later life in Thanjavur with her younger brother, and named his first daughter after her. Kalki’s other sources were stone inscriptions, copper-plates and other books. There is a stone tablet in the great temple of Thanjavur which has the following inscription: “The revered elder sister of Raja Raja Cholar, the consort of Vandiyadevan, Azwar Paranthakar Kundavaiyar”.The book History of Later Cholas has a five line reference to Vandiyathevan, a Bana prince, a real historical character, who became the hero of this novel. The names of the conspirators also came from a stone inscription. A lot of the information about the activities of various kings came from inscriptions like these as well as copper plates like the one found at Anbil. The Thiruvalangadu copper-plates state, "The Chola people were very keen that after Sundara Chola, Arulmozhivarman should ascend the throne and rule their country. But Arulmozhivarman respected the right of his Uncle Uttama Chola, the son of his grandfather’s older brother, Gandaraditya, to the throne and crowned him King".